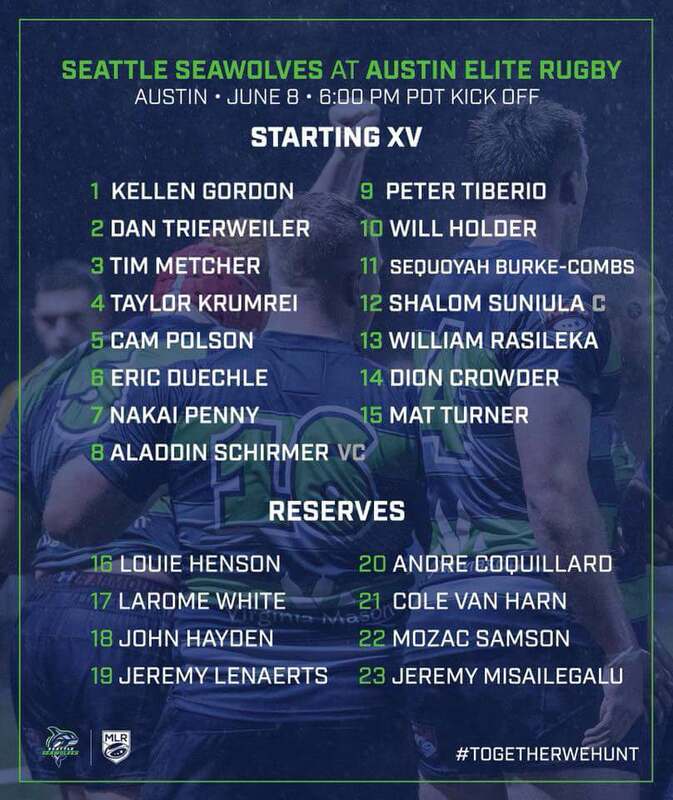 The Seattle Seawolves headed to Texas for the second week in a row, this time to take on Austin Elite Rugby. Seattle was able to pull out the victory after trailing for the majority of the match. 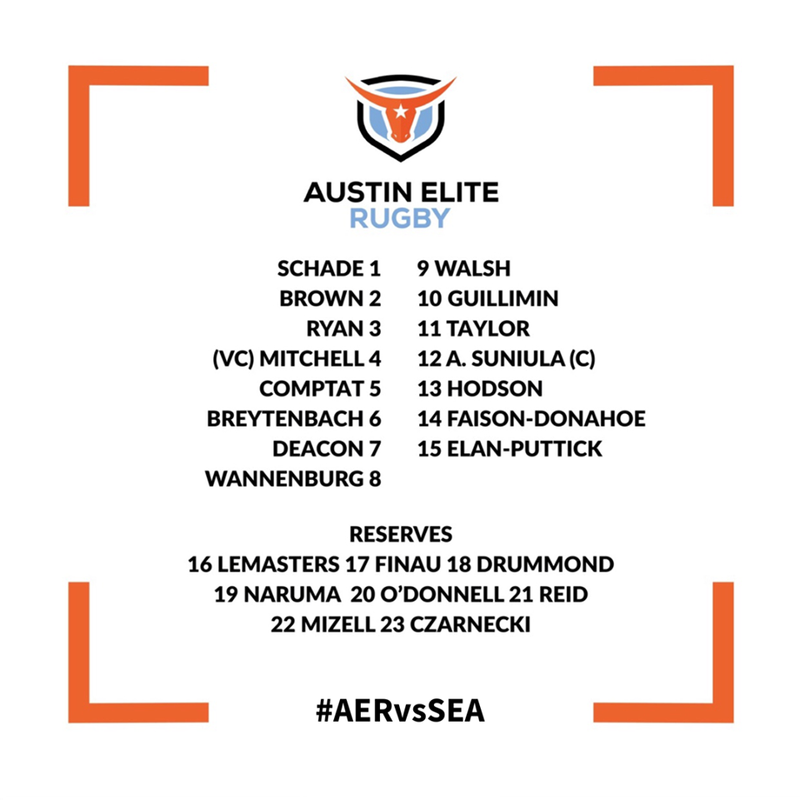 Austin will surely be disappointed but they will take away the fact that they are a top team in Major League Rugby. Timothée Guillimin got the scoring started in this match. He converted a penalty kick from in front of the sticks. Will Holder looked to respond for Seattle, but his penalty kick was wide of the mark. Guillimin extended the Austin lead with another penalty kick. Mat Turner helped keep Austin out of the try zone. Ross Deacon was chasing down a kick when Turner came over, knocked it back out of Deacon's reach and cleared it out of danger. Deacon then came back and extended Austin's lead. He picked the ball out of the ruck and went over the ruck through the Seawolves defense for the try. William Rasileka was first on the board for Seattle. He scored a similar try to Deacon's. Rasileka picked the ball out of the ruck and powered through three Austin tacklers for the try. Timothée Guillimin added another penalty kick to extend Austin's lead to 16-5. Will Holder made up for his earlier penalty kick miss, with a converted kick from directly in front of the posts. Aladdin Schirmer looked to be free and clear for the try, but Austin was able to chase him down. Holder looked for the cross kick after Schirmer was brought down, but had no chasers and gave possession back to Austin. Seattle is definitely missing their international players. Perhaps Phil Mack more than any, as Mack also served as the head coach. The Seawolves had opposite set pieces in the first half. They lost almost every lineout, but won almost every scrum. Austin was able to take advantage of Seattle miscues, but had a few of their own. If they had been able to secure a few balls, they might have had a bigger lead than 16-8. Sequoyah Burke-Combs started Seattle's comeback. After being down in Austin territory for a while, the Seawolves went wide and eventually found the ball in Burke-Combs' hands for the try. Aladdin Schirmer looked to give Seattle the lead, but Zinzan Elan-Puttick was able to chase him down and force a knock on. Taylor Krumrei gave Seattle their first lead of the match with over three quarters of the match completed. Eric Duechle looked to be free and clear for the try, but Elan-Puttick was able to make a try saving tackle again. Krumrei rumbled his way down the field, was given the ball, and powered his way over for the try. The game became close in the second half, so Austin took the points on offer and Timothée Guillimin converted another penalty kick that brought Austin to within one point, 20-19. After this kick, Austin had trouble getting in position to score more points. They spent the rest of the match in their own territory. Austin had a great first half, but fell apart in the second half. They looked to give the Seawolves their second loss on the season, but the Elite committed too many mistakes that allowed Seattle to claw back for the win. They had a great lineout in the first half, but they had a horrible scrum the whole game. They'll need to fix that if they want to advance in the playoffs. Seattle was really missing their internationals, especially Phil Mack. They did a decent job of clawing back for the win, but they'll be in trouble against a stronger opponent. The Seawolves scrum was fantastic. It was reminiscent of the match against San Diego, only this time without the penalty tries. Seattle will have to figure out how to play without their internationals if they want to keep their momentum heading into the playoffs. Austin have an extra two days to recover before they head to San Diego to take on the Legion on Sunday, June 17th. Seattle heads to Infinity Park to take on the Glendale Raptors in a battle for first place on Saturday, June 16th.